There are no planned basket Weaving workshops being offered January-March 2019. However, please email russell@riverfolk.org if you are interested in a future class as we always need a minimum of 5 students and with interest, we can offer at any time. Blackstone River Theatre will offer a workshop in Basket Weaving with master basket weaver Elwood Donnelly. 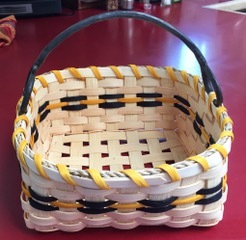 This four-hour workshop for beginners in Basket Weaving will be offered Saturday, April 21, from 12 to 4:00 p.m. A minimum of 5 students is needed to hold class; maximum of 8 students. Fee for the workshop is $ 75.00. Prepayment is necessary so we have time to purchase the materials and tools. In this 4-hour workshop, participants will learn the skills to make beautiful and functional baskets while completing a project to take home the very same day. The focus in this workshop will be making a Napkin Basket. (note: the handle for this project will be made from reed, not metal as pictured here). Future workshops will explore other types of baskets and more. All materials costs are included in the workshop fee and the tools will become the property of the participants for use in future projects. Please bring a hand towel, pencil and measuring tape. So we can be assured of meeting the minimum needed to hold this class (AND so we can order tools and materials), BRT NEEDS PRE-PAYMENT.